From AHRQ Website: The Agency for Healthcare Research and Quality offers a free booklet and a video about blood thinner medicines. Staying Active and Healthy with Blood Thinners, a 10-minute video, features easy-to-understand explanations of how blood thinners work and why it's important to take them correctly. Blood Thinner Pills: Your Guide to Using Them Safely, a 24-page booklet, explains how these pills can help prevent dangerous blood clots from forming and what to expect when taking these medicines. The video and booklet are available in both English and Spanish at ahrq.gov/consumer/btpills.htm. Editorial Comments from Dr. Bussey: While this video provides a lot of good information, there are a few areas that might need clarification or further information. 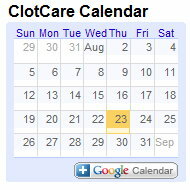 For those reasons, I would encourage those who find this video useful to also review thoroughly the ClotCare posting at clotcare.org/clotcare/newtowarfarincoumadin.aspx. One example that may require clarification is that the video refers to warfarin as a "blood thinner." While warfarin is often referred to as a "blood thinner", it is rather misleading in that warfarin does not actually thin the blood. Rather warfarin reduces the ability of blood clotting proteins to function normally, which makes it harder for the blood to form a clot. Some warfarin patients have attributed feeling cold or dizzy, or having a change in certain blood tests, to the idea that their blood is thinner; these conclusions are not correct. An example of where further information may be useful relates to empowering the patient to perform valuable self-monitoring. For example, if a warfarin patient's urine turns brown or pink, or if the patient's bowel movements turn black like tar, these changes can be signs of serious bleeding that require immediate medical attention. Because of the issues described above, we encourage those new to warfarin to both view the video and review that information listed at clotcare.org/clotcare/newtowarfarincoumadin.aspx. If, after reviewing the video and our posting, you have any questions; please submit them to the webmaster@clotcare.org and we will be happy to address your questions.